Twenty-eighteen has been a big year for 18-year-old Kelsie Mitchell. 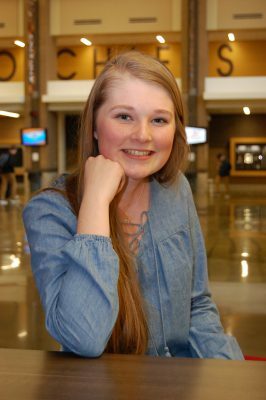 She was one of nine valedictorians graduating from Springfield’s Kickapoo High School, served on student council’s Cabinet leadership group, and was a member of the National Honor Society. And she has made plans to attend Truman State University in the fall. But just eight years ago, her main accomplishment was survival. “That’s the biggest memory I have of my childhood,” she said. 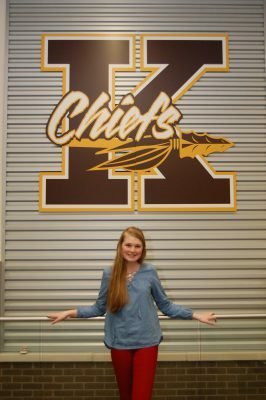 Kelsie was diagnosed with Ewing’s Sarcoma, a bone cancer, after what she and her parents assumed were growing pains led to the discovery of a tumor on her right hip. She was then sent to Children’s Mercy Hospital in Kansas City for biopsies. At the time, she was already familiar with the word “cancer” because her mother, Laurie Mitchell, had volunteered with the American Cancer Society’s Relay For Life fundraiser. But in Kelsie’s 10-year-old mind, cancer wasn’t something that happened to kids. “When I was first diagnosed, I was like, ‘Gosh darn it!’ But then I thought, ‘Let’s fix it.’ When I started going through treatment, I started to realize how bad it was. I didn’t realize how hard chemo would be until I was going through it,” Kelsie said. Treatments took place at Children’s Mercy Hospital in Kansas City, where she would stay for a week of chemotherapy, and then return home to Springfield for two weeks. She would then return to Kansas City for another week of chemo, and repeat the process. Kelsie endured 14 chemotherapy treatments and 35 radiation treatments. She also required several whole blood and platelet transfusions, receiving blood from CBCO donors. “We’d have a nurse come and check my bloodwork every so often. It was like clockwork. Almost every time I’d have chemo, about 7 days later I’d need blood in town at Cox, and I got platelets sometimes too,” she said. Kelsie needed blood following approximately 10 of her 14 chemotherapy treatments. Kelsie has not needed additional blood or platelets since her initial diagnosis, but she has had a few cancer-related setbacks. When she was 15, her thyroid was removed after cancer was discovered there. And in 2016, cancerous lymph nodes were removed. Chemotherapy caused a heart condition that she must watch, and she said she is at an increased risk of developing cancer again in the future. Kelsie’s parents are both blood donors, but due the type of cancer she has had Kelsie is unable to donate. This was disappointing news to Kelsie who, like her father, Ben Mitchell, has the O Negative blood type. O Negative is the universal blood type because it can be given to any patient with any blood type. Those with O Negative blood type can receive only O Negative blood. One in 15 people (or 6.6% percent of the population) has type O Negative, making donors like Kelsie’s father in demand. primarily occurs in children and young adults. • Often found in the long bones in the body. • Symptoms include pain, swelling and fever. • Accounts for about 1% percent of childhood cancers. Ewing sarcoma in the U.S.